Three seniors signed letters of intent Wednesday, Feb. 6 on National Signing Day. Congratulations to our soon-to-be collegiate student-athletes who made their commitments on National Signing Day. 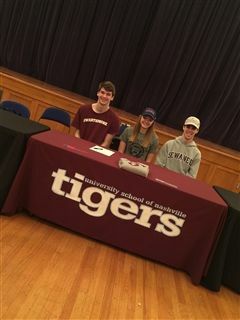 George Corzine '19 will play tennis for Swarthmore College, Joe Orem '19 will continue his lacrosse career at Sewanee: The University of the South, and Maggie Robinson '19 has been picked up by the University of Pennsylvania's soccer team. Joined by their families and coaches, these students signed letters of intent in the Auditorium and enjoyed cake with classmates and faculty. Gymnast Adam Wooten '19 previously committed to the University of Michigan. 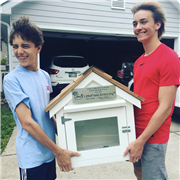 George Corzine '19, Maggie Robinson '19, and Joe Orem '19 share their commitments on National Signing Day.